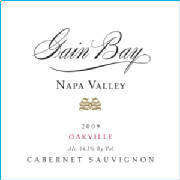 Gain Bay 2009 Napa Valley Cabernet Sauvignon – Oakville Appellation is the first straight Cabernet Sauvignon bottled under the Gain Bay moniker, so it certainly is the finest single bottling to date! Overview: After the ’08 Cabernet Family inventory blew out after the 90 Point – Editor’s Choice degisnation, I started looking at samples just before harvest, but it was an in-between time – too early for 09’s and too late to find quality 08’s. So I waited. Just after harvest was over, an old friend caught up with me with this block of barrels from the Oakville Appellation and I jumped – it was nearly perfect! All that was left was round the aroma off with one barrel of Cabernet Franc, which I found from last year’s supplier and I added one barrel from the St. Helena Appellation to excentuate the softness in the mid-pallette and the wine was done. Bottled in St. Helena the first week of December, 2010, this wine is exactly what a negociant looks for; complex aroma of earth, oak and subtle plum and berry, silken texture with bold currant and cherry flavors, and a complex finish of pomegranate and spice. It’s a classic Gain Bay wine with the silken texture, but more assertive and bold than previous wines. The Vintage: 2009 in Napa Valley was ideal, as long as the grower held down the tonnage and fully ripened the berries before a mid-harvest rain set in. Otherwise, it’s a textbook year for Cabernet Sauvignon in Napa Valley. The crop size was moderate. Harvests dates were either early or late, depending upon the crop load and that rain. For those earlier ripening vineyards, the flavors were fully loaded and intense and fruitful. The Wine: Initial aroma impact is of earthen forest floor, and in the background, plum and cherry emerge. On the palate is where this wine shines. The wine is best described as unbelievably silky smooth, with a velvety texture. Flavors of cassis/plum/and berry bound from the glass. The finish is unusually complex, with lovely moderate tannins, and slight pomegranate tones. Fully powerful, this wine’s beguiling aromas, soft textures and a complex lingering finish are exquisite. The Specifics: Cabernet Franc (4% of the blend) is the heart of the aroma and, not since the 2005 vintage has something this berry-like shown up. The Cabernet Franc was aged oaks from various forests, but all older ’05 barrels – perfect! The Cabernet Sauvignon came from 2 sources. The main lot (92% of the total wine) was from a vineyard in central Oakville appellation. The last lot (just 4%) is from one of two barrels off my father’s little vineyard in St. Helena – pure power here!